Noise induced Hearing Loss leads to an average injury claim of £18,000. For a small fee we will test your staff ensuring that their hearing is monitored and that personal protection is used properly and effectively. We have fully trained staff who will come onto your premises and run your hearing testing programme for you, ensuring that you meet your obligations with respect to the HSE Noise at Work Regulations. Screening programmes also reduce the risk of costly injury claims, many of which are settled automatically by insurance agencies due to the lack of evidence of hearing care in the workplace. Pre - Test Health Questionnaires - These are aimed to identify any factors that may have a result on testing i.e. previous hearing problem, recent surgery to the ear, any accidents that may affect the ear, workplace environment, or even if the person is suffering from a simple cold. 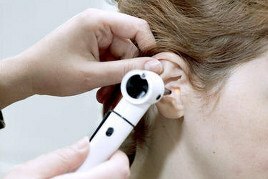 Otoscopic Examination - Before conducting the hearing test a Otoscopic examination is required to check that the ear is in a healthy condition. The check involves looking into the ear canal and making sure there is no excessive wax, inflammation or foreign bodies. Audiometric Test - The test involves the employee wearing a set of headphones and identifying any audible noise they hear (both ears are tested seperately) by pushing a response button. Review of test results - The results are then looked at and discussed with the employee (even when their hearing is good, it is important for the employee to understand their responsibilities in looking after their own hearing). The results are then categorised in accordance with the HSE classification criteria. Referral - If any issues are identified then a referral to the employees GP may be appropriate. All employees screened will receive a FREE copy of HEARING/AWARENESS information leaflet. Employer's summary report - outlining the findings of the screening. This gives the employer the opportunity to look at trends and assess the best Hearing Conservation Programme for the company. Call to discuss dates to suit your calendar.